I’ve been using Anne Semonin Brightening Serum and Cream for a few weeks, so now it’s time to share my thoughts on them with you. Disclosure: These products from Anne Semonin were sent to me for review, but the opinions below are my own and unbiased. The Anne Semonin brand was established in 1985, and develops luxurious beauty products and treatments to enhance your skin’s radiance. Anne Semonin herself was facialist to stars such as Princess Grace of Monaco and Catherine Deneuve, and Anne Semonin products are used in prestigious locations around the world. They combine the latest developments in cosmetology with natural active ingredients, marine and plant extracts. 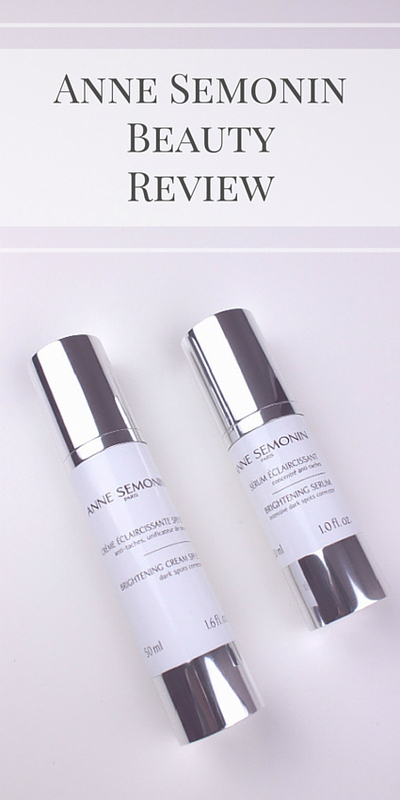 I was sent two products to try out from the Anne Semonin White Star skin brightening range. 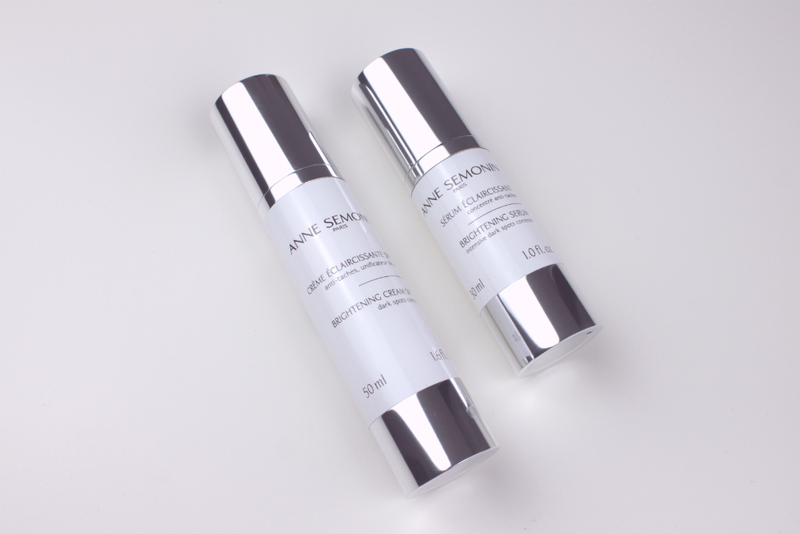 These were the Brightening Cream which retails at £74.00 and the Brightening Serum which retails at £96.00. They are priced at the upper end of the skincare market, and I was interested to see what sort of results I would get from them. Both of these products are designed to help brighten the complexion and reduce brown spots and pigmentation. The Serum contains Vitamin C, sea flowers and brown algae to correct dark spots and visibly light up the complexion. Detoxifying antioxidants also help to neutralise damage from air pollutants. The Brightening Cream contains an advanced vitamin C derivative, a sea flower and a brown algae. They help to reduce pigmentation and give a brighter, more even complexion. It also includes an SPF 15 to protect from sun damage, and anti-oxidants to protect against environmental damage. I’ve already written my First Impressions post which you can read here, but basically I really love the look and feel of these products. They are both packaged in classic silver and white tubes, which I love as it looks so elegant on my skincare shelf. I was really pleased to see that both products have a pump dispenser. Not only does this make it easier to avoid wasting the product, it also helps to preserve the active ingredients which can be degraded by contact with sunlight. I tested both of these products for around 3 weeks before writing this review. The serum is suitable for use both day and night, and I used the Brightening Cream in the mornings as well. I continued using a dedicated night cream in the evenings as usual. The Brightening Serum is a creamy serum that has very little scent at all. I was actually quite surprised at how moisturising it feels when I applied it, and it absorbs very easily into my skin. After using just one pump of this serum over my face and neck, my skin already feels soft and smooth. The Brightening Cream is quite thick and has a scent which is not unpleasant, but it took me a couple of days to get used to it. Although the cream is quite thick, you don’t need to use a lot of it. It does absorb fairly easily and leaves my skin feeling very balanced. Generally my skin tends to be dry across the forehead and cheese, and then quite oily around my nose and chin. The Anne Semonin products has have helped to balance out these differences, and I found that they give an excellent base for makeup. It’s worth noting that the cream does contain the suncreen ingredient Oxybenzone. This helps to protect against UVB rays (the ones that age your skin) but some people can be sensitive to this ingredient. The photos below show my skin without makeup before (L) and after (R). Before using the Anne Semonin products, I didn’t think that I had much of an issue with pigmentation so I wasn’t sure how much of a difference they could make to my skin. But after using the products regularly for a few weeks, I think my skin definitely looks brighter. I’m generally more confident about going make-up free because my skin looks more radiant and smoother. As a bonus, I’ve also found that foundation stays in place better around my nose and chin because that area is less oily. I’ve really enjoyed testing these products because the effect on my skin has been so good. The Brightening Serum in particular has become a favourite product because it leaves my skin feeling wonderful. I’ve been impressed with how radiant my skin looks, and the fact that my combination skin feels more balanced. Anne Semonin create premium skincare products, and I think they definitely give excellent results. However they do come with a price tag which won’t be practical for everyone. But if these products fit within your budget then I highly recommend trying them. 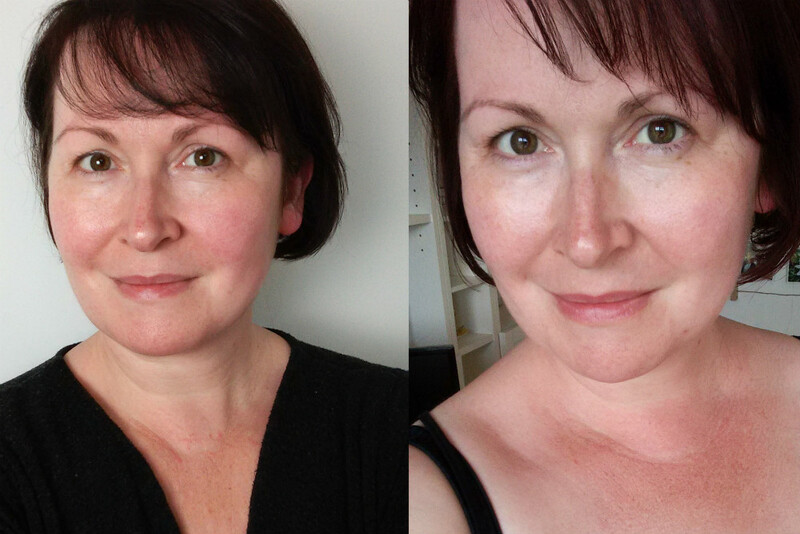 Thanks Rhian – I’ve been really happy with the products! Oh wow I can see the difference. You look great Sally. Thanks Charli, I’ve been so impressed by these products! These sound like great products, I would love to try them. It’s not a brand I’d tried before, but definitely one that I want to find out more about! You look lovely! I have never tried products like these before, they sound great. wow you can see a difference! You skin does look lighter and more radiant. Interesting about the sunscreen ingredient, I get a rash using certain sun tan lotions, wonder if this is why? It could be – might be something worth looking into? Your skin is literally glowing you look amazing, my skin is so dull so I need a good serum to give it more life! I think it’s made a huge difference to your skin, it looks lovely! Thanks Sam, I’m really pleased with the effect! I use the Anne Semonin night serum and I love it, I was new to this brand a few months ago, I now need to purchase a new daytime moisturiser and think this will be my purchase.